Guided by the framework of her Bay Area upbringing Molly moved to Vancouver, BC to attend the University of British Columbia where she studied First Nations and Indigenous Studies. The powerful group of professors and peers she had the honor to work with cracked open her perception of land and resource politics in both Canada and the US. Molly returned to the Bay Area in 2015 striving to do accountable work in the community she was raised in. 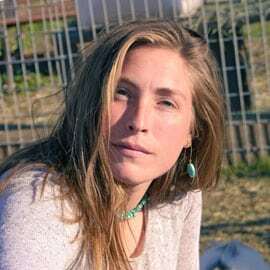 She worked for four years teaching and facilitating youth in nature awareness skills, while simultaneously living and working on a small horse ranch and homestead for a year. During her time roaming the hills and wetlands of the Bay Area with youth she nurtured and developed a strong interest in plant communities and their restoration. Molly believes the relationship of various plant communities on different land bases can present an interesting parallel experience to our own. She feels deeply about exploring the connections between land and human health, shifting human community away from anthrocentrism, living in dedication to the land she occupies, and honoring the sovereignty and actions of the Indigenous nations of California. As of September 2018 Molly joined the Quail Springs community on traditional Chumash territory. She is honored to live out her wildest dreams planting, growing, and tending to the land and community.